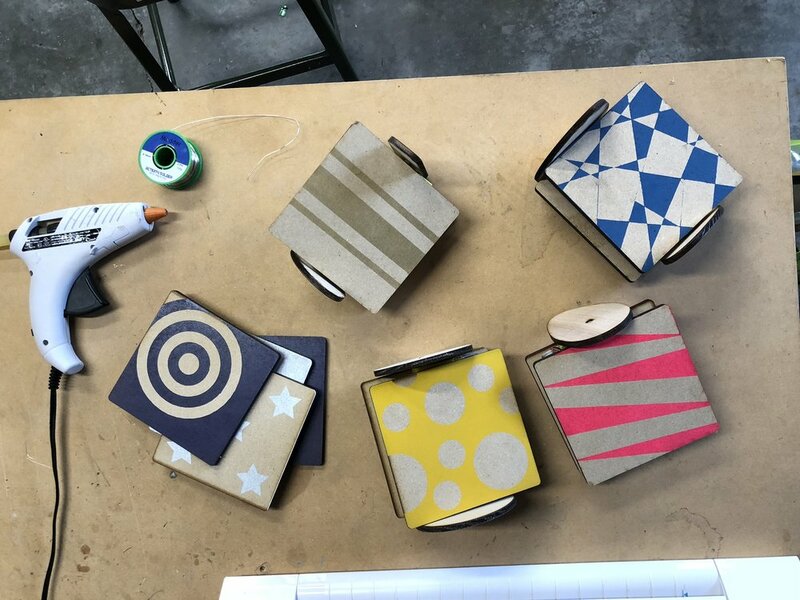 Experimenting with Scrappy Motion Boards — Wonderful Idea Co.
Over the past few weeks we’ve been experimenting with a new microexhibit idea with students and teachers at Lodestar Charter School. 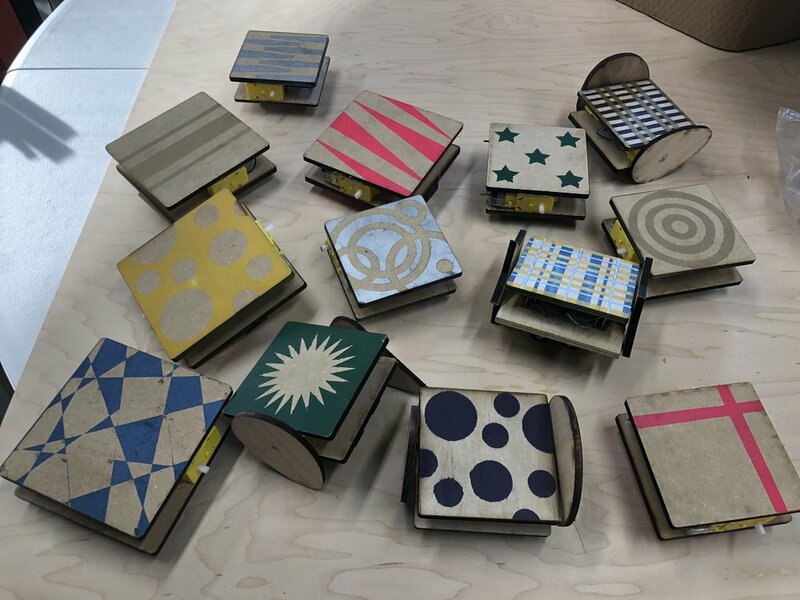 Ore the past year, we’ve been creating a suite of lightly facilited, affordable and friendly kit-of-parts that teachers can use with students in drop-in making time and adapt to be used to support more focused lessons. 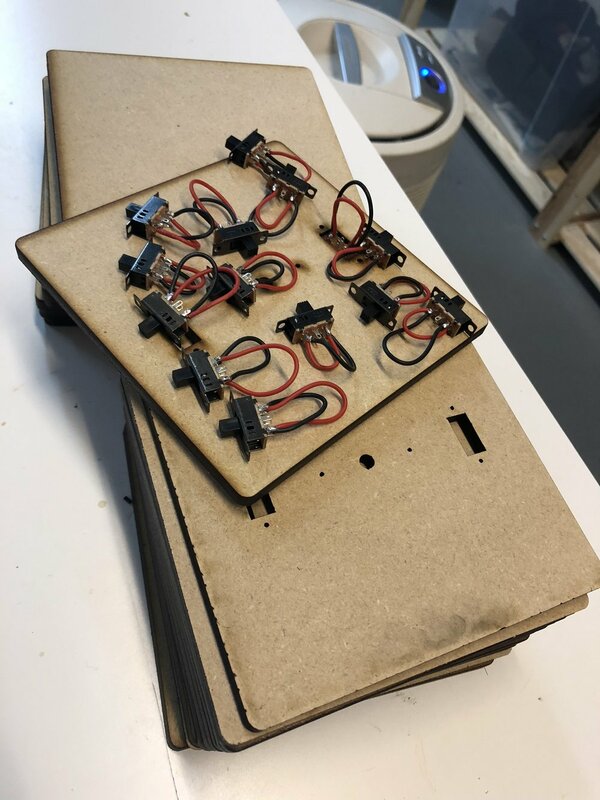 Separately we’ve been experimenting with the possibility for DAGU motors in all kinds of tinkering experiments due to the fact that it’s cheap, sturdy and ubiquitous. 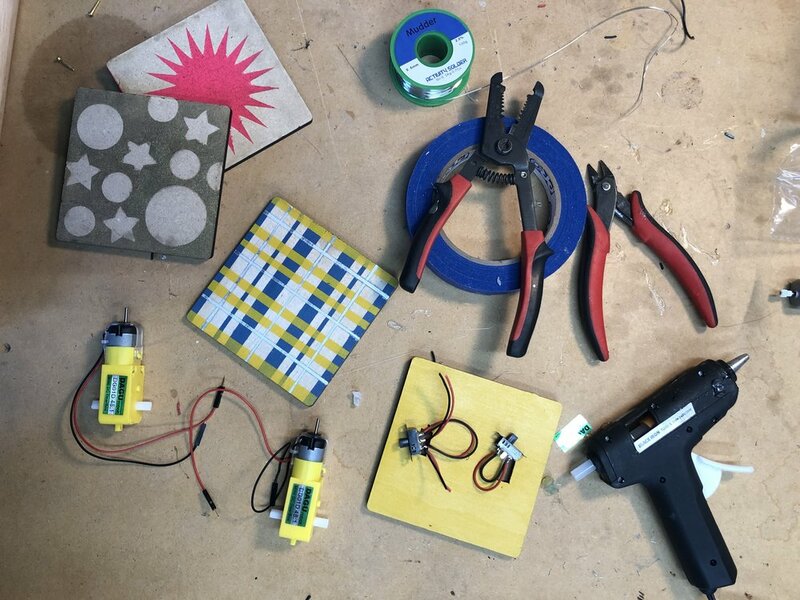 After our experiments with useful/useless machines last year at EB Maker Faire and the twisted turtles workshops this summer, I thought that it would be fun to try to make a kit of “motion board” parts that could be an unfaciliated table top experience. 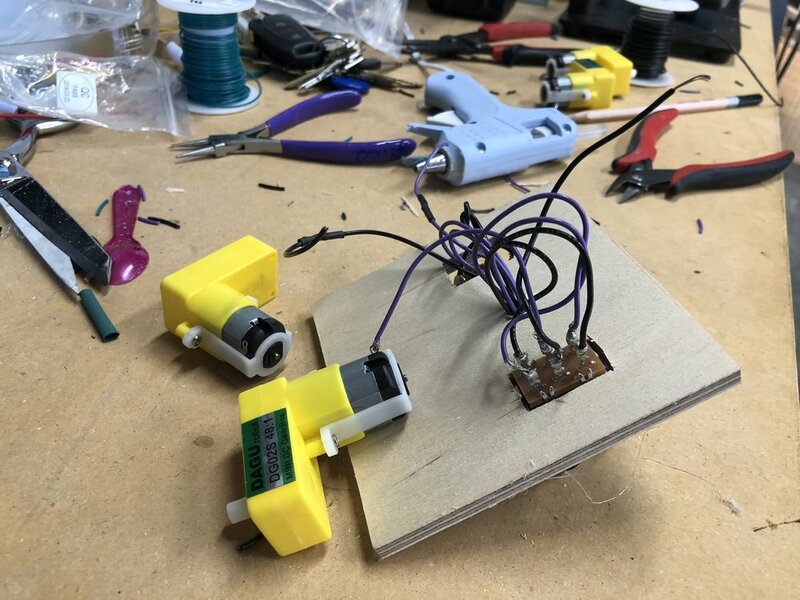 Recently I was inspired by a twitter post by Nick Mannion about a set of LEGO shapes connected to the pullstring motor that Tinkering Studio and LEGO Foundation have been experimenting with. There have been a lot of inspiring LEGO creatures made by the #LEGOtinkering team and I thought that it might be possible to recreate some of the interesting motions produced by the wide variety of shapes with the DAGU motors and other common electronic components. For the first prototype I cut out a pasic shape for the body using scroll saw used a couple of DPDT switches that I found in our materials wall. I wanted to be able to flip the switch and change the direction of the motor so that learners could experiment with the different movements with the wheels rotatign in the same or opposite directions. For the initial test, I was really happy to see how much of a difference the various laser cut wheel shapes worked for the machine. Depending on the arangement of the hubs the little bot could spin, wobble or flip around. With a couple googley eye on the top lended a lot of personality to the little critter. Since I was traveling to amazeum for the last installation of my Maker Residency and the big Tinkerfest event, I thought I would bring my current work in progress. 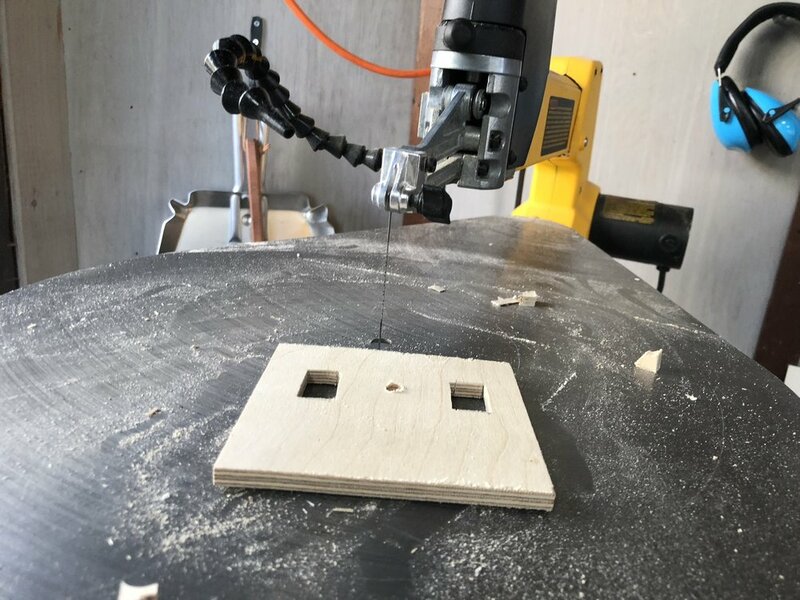 I connected with Joel and we cut out a ton of interesting shapes for the bot! We added a little Tinkerfest sign to the body and let the bot loose in the museum. It was really fun to see people start to experiment with changing the wheels and trying out different motions. 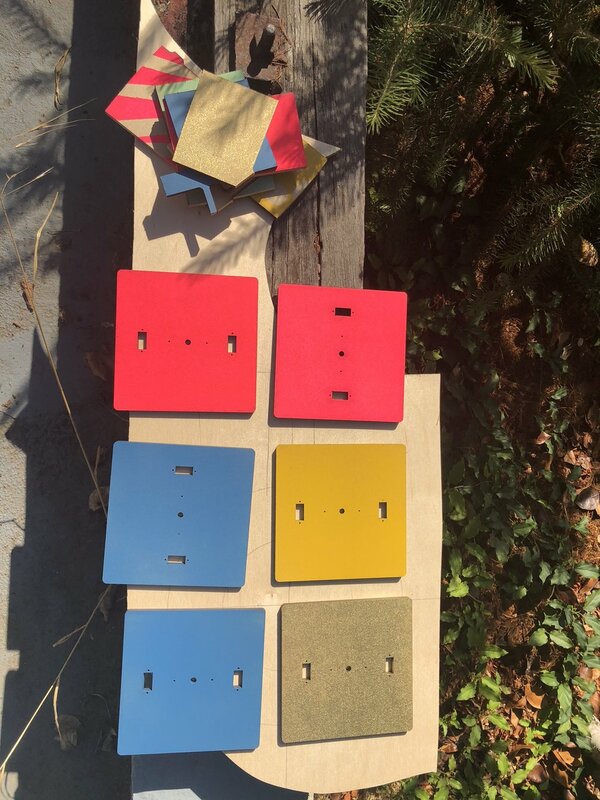 After returning to the WICO shop, I started making a set of the boards. I designed a illustrator file so we could laser cut the exact shapes of the components. At first I made it a bit bigger than the original model, but the extra weight of the material made it too hard for the motors to satisfyingly move the bot so I redeisgned the file and reduced the size of the boards to a four inch square. I also upgraded to 3-position DPDT switches to that the motors could be turned off without removing the batteries. We vinyl cut different patterns for the bodies and spray painted the designs different colors. With these changes in mind, I made eight boards for the first testing with students at Lodestar Charter School. We had four prototyping sessions with third graders and first graders. It was fun to see all the different motions they came up with, how they named the bots and describled their personalities and created battles or dance parties for the bots. It was also great to get their feedback about things to add to the exploration or interesting ideas to try. We thought about adding ways to make music, have the bots draw pictures or add faces to the tops to give them even more personality. We have more testing time scheduled with the students as part of a grant to develop these micro-exhibits so we’ll plan to try out more experiments at Lodestar Charter school in the coming weeks. 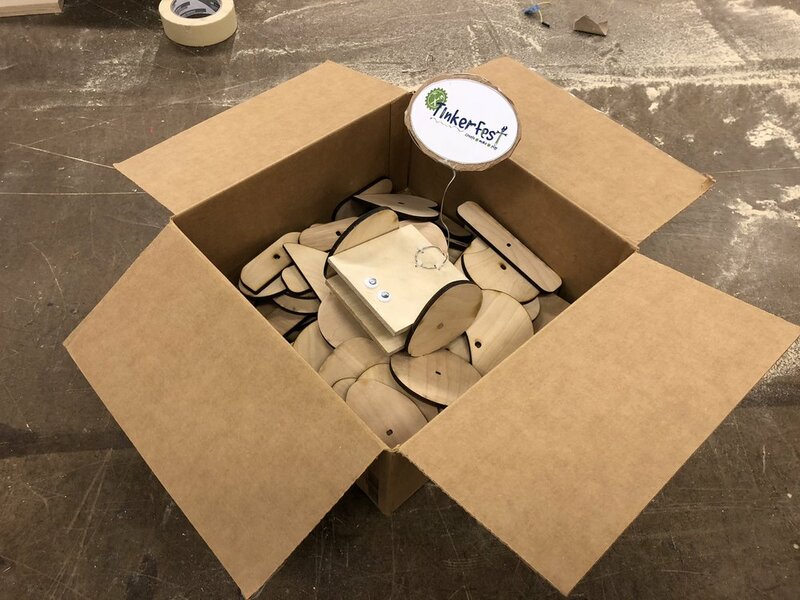 We’re planning to bring the little motion boards to East Bay Mini Maker Faire this weekend and let tinkerers of all ages experiment with this prototype. We’re creating a collaborative cardboard testing surface for the machines so that they can demonstrate their quirkly motions. Nicole also created a beautiful chalkboard sign with labeled parts and a diagram of the electrical wiring so hopefully it will encouraged people to get the components and make their own little scrappy bot!